Use of force by the police is governed by regulations not primary legislation and a very significant accountability gap persists. According to the Constitution: "Every person shall have the right to live and to defend his/her life and existence."Art. 28A, 1945 Constitution (as amended).Every person shall also "have the right to be free from torture or inhumane and degrading treatment".Art. 28G(2), 1945 Constitution (as amended).The rights to life and to freedom from torture are human rights "that cannot be limited under any circumstances".Art. 28L(1), 1945 Constitution (as amended).Every child shall have the right "to protection from violence".Art. 28B(2), 1945 Constitution (as amended). The Constitution further stipulates that the "defence and security of the state shall be conducted through the total people's defence and security system, with the Indonesian National Military (TNI) and the Indonesian National Police (INP) as the main force, and the people as the supporting force".Art. 30(2), 1945 Constitution (as amended).Unusually in terms of structure, the INP reports directly to the President. Law No. 2 of 2002 concerns the national police along with Presidential Decree No. 70 of 2002 which addresses the organisation and operation of the Police. There is no primary legislation specifically governing the police use of force. Instead, the use of force by law enforcement officials in Indonesia is governed by two regulations issued by the Chief of the Indonesian National Police: No. 1 of 2009 on the Use of Force in Police Action (Perkap 1) and No. 8 of 2009 on the Implementation of Human Rights Principles and Standards in the Discharge of Duties of the Indonesian National Police (Perkap 8). According to Perkap 1, force should be used only as a last resort, in proportion to the threat posed, and should be formulated with a view to minimising damage or injury. Force "can be applied only when it is necessary and inevitable according to the situation being faced”.Article 3(b), Perkap 1.As further set out in the Regulation, police action should be “used in an accountable manner according to the prevailing law, to prevent, impede, or stop a subject’s behaviour that threatens the safety or endangers the life, property or chastity of others. 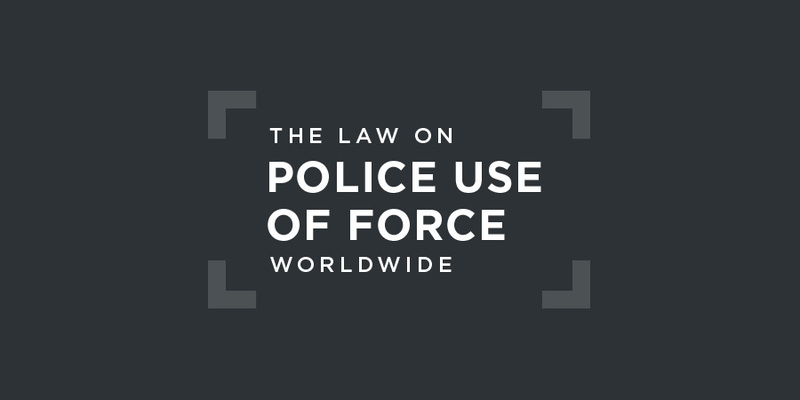 The force is used to create order and enforce the law, as well as to maintain peace within the community”.Article 1(2), Perkap 1.It should respect the principles of legality, necessity and proportionality. All police need to ensure that “the use of force has to be carried out in a balanced manner, between the threat being confronted and the level of force and response by the INP officer so as not to cause excessive losses/injuries/suffering”.Article 3, Perkap 1.
h. damage and injury resulting from the use of force must be kept to the minimum. (1) The use of firearms shall be allowed only if strictly necessary to preserve human life. f. respond to a situation that endanger lives, where more persuasive measures are inadequate. Prior to the use of firearms, a police officer must issue a clear warning by:Article 48(b2), Perkap 8. 3. providing sufficient time for the order to be carried out. In "extremely pressing circumstances where a delay could result in the loss of life or gross injury of the officer or another person within the vicinity", the above warning "is not necessary".Article 48(c), Perkap 8. According to Regulation No. 1 of 2009, police action should be “used in an accountable manner according to the prevailing law".Article 1(2), Perkap 1.Perkap 1 provides that a commander who instructs a police officer to use force "shall be held accountable for the risks/results of the force used when the ordered INP personnel do not deviate from the given directions”.Article 13(4), Perkap 1. Perkap 8 requires that following a use of firearms, the officer reports such use; provides medical attention to any person sustaining a gunshot wound; notifies the family or relatives of the injured or affected person; and prepares a detailed report on the use of firearms.Article 49(2), Perkap 8.If a person "objects or feels adversely affected by the use of firearms by the officer", that officer "shall provide a detailed explanation on the reason for the use of the firearms, what actions were taken and the result of such action"; and an investigation must be commenced in accordance with the law.Article 49(2), Perkap 8. In 2013, the United Nations Human Rights Committee expressed its concern that "the National Police Commission, which is mandated to receive public complaints against law enforcement personnel, is weak as it has neither powers to summon law enforcement personnel nor the mandate to conduct independent investigations".Human Rights Committee, Concluding observations on the initial report of Indonesia, UN doc. CCPR/C/IDN/CO/1, 1 August 2013, §16.In August 2017, Amnesty International expressed concern about police accountability in Indonesia, which is hampered by the lack of an independent, effective and impartial oversight mechanism to investigate human rights violations allegedly committed by the security forces.Amnesty International, "Indonesia: Investigate police's use of lethal force against Papuans in Deiyai", 15 August 2017.
take appropriate measures to protect the rights of political dissidents and human rights defenders. It further stated that Indonesia "should systematically and effectively investigate and prosecute cases of extrajudicial killings and, in the event of a conviction, punish those responsible, and provide adequate compensation to the victims’ families".Human Rights Committee, Concluding observations on the initial report of Indonesia, UN doc. CCPR/C/IDN/CO/1, 1 August 2013, §16.